After a lazy couple of days with not much worthwhile writing about we (I am still hanging out with the Swedish bunch mentioned in my last post) decided to do something with the day. It was either a trip back to the beach on the Ganges for some swimming or to visit the famous Maharishi Mahesh Yogi Ashram made so by the Beatle’s visit in 1968. 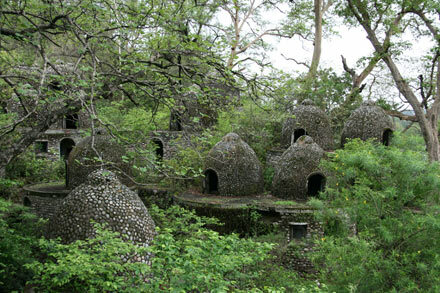 After bribing the guard, or perhaps he is a very lazy and stroppy owner, and his spiritual accomplish with 50 rupees per person (quite pricey at 73p; my breakfast cost the same) we clambered up the steep incline and past the meditation huts through some of the 2km grounds to the now derelict ashram. It was a very interesting place with shards of broken glass everywhere and crumbling brickwork. Every building is open to walk around and there is a cool painting featuring Beatles imagery in one of the bedrooms that was painted by an unknown German artist. Even if the Beatles hadn’t blessed the haloed grounds of the ashram it would still be a cool place to explore. According to Wikipedia the Beatles “ate three vegetarian meals daily, and had wide-ranging conversations”, it sounds exactly like my time here except finally last night after a week of abstinence from booze we finally managed to get our hands on some beers! Exciting times. We drank the one restaurant that serves them in town dry, a poultry two cans each of my least favourite alcohol Fosters. 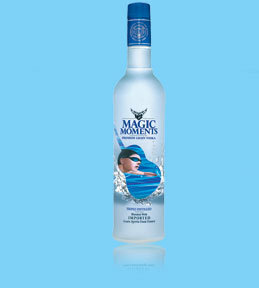 We were just getting into the swing of things when we ran out so three of the Swedes went on a booze hunt and managed to get lucky with a delicious bottle of Indian vodka called Magic Moments that we got delivered by courier for an eye watering 1500 rupees. The drink is so good that the label features a swimmer drinking the fine spirit (with grain imported from France no less) while swimming. Notice the intricately carved guitar silhouette too. Classy stuff. The average age at the ‘youth’ hostel was probably about 55, so after a night with them all snoring in some kind of orchestral fashion in different times, pitches and paces; I checked out. During the day I did lots of amazing tourist things. I went to the Old Fort, Humayun’s Tomb which apparently the Taj Mahal was based on and then onto the zoo where i got whisked around in a limo golf cart for 50p. The standards of welfare at the zoo were actually okay. I was expecting them to be horrific but there was of course the standard pacing animal. London Zoo has their pacing tiger, New York has the pacing snow leopard (looking much happier in this video than when i saw it going mad) and Delhi has their psychotic lion. On Sunday I spent most of my day (nine hours) in an air con taxi going from Delhi to Rishikesh via Haridwar with a Russian couple and their one year old child. I’m not quite sure how I ended up with them but I originally went to the bus station to hop on a bus that should have taken five hours. The queues for tickets and the panic to get on crammed buses was too much to handle or even understand and these group of seven people from Belarus said i should share a car with them. An hour later I was in a car with the yoga king of Moscow (apparently he owns a yoga school there) and the queen of Goa (she had been there for the last four months) and a child (which i think was theirs) who would go around eating dirt when we stopped. We were originally going to just stop in Haridwar but the problem with that was we arrived at 10pm and the legendary Kumbh Mela was in full swing. Imagine Notting Hill Festival but over the whole of London, or Glastonbury ten times the size and in a city. There where tents everywhere as we drove through and the whole town was covered with fairy lights. So it would have been nearly impossible to get accommodation. Amazingly though all of the traffic was still moving! Check out this video Chloe sent me before I even knew I was going to Haridwar to get a sense of the occassion. I luckily called ahead to a hotel i’d been recommended by the only youth in the hostel, Mama’s Cottage on the High Bank in Rishikesh. She only had one room left (the one i had reserved earlier in the day) which the Russians got so I had to sleep in her lounge with her young son/cook on the sofa opposite me. I have to stay in the lounge tonight too because she is still full. I don’t mind though it’s only £1.50 a night, i get to call her mama and she’s currently doing my washing. I’m off now to explore why The Beatles fell in love with this place.